Jake is dreadfully embarrassed by his Dad’s Ugg Boots. In fact Jake must have the most embarrassing Dad in Australia. It is especially humiliating when Dad wears them with boxer shorts and nothing else and chases the garbage truck down the street. Ugg boots are ruining Jake’s life and he knows he has to do something to stop his father from going out in public with those horrible things on his feet. Maybe if the boots disappeared Dad would find something else to wear. This is a very funny story about Jake and the inventive ways he goes about solving the problem of his father’s embarrassing habit. Of course it backfires in a spectacular way. 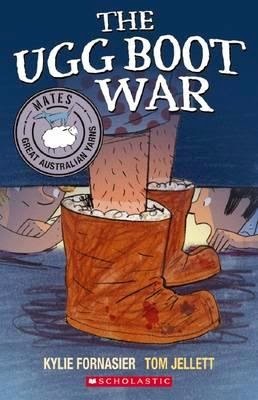 I really enjoy all the books in the Mates - Great Australian Yarns series. The Ugg Boot War is another wonderful title. From the expressive text which brings the characters vividly to life; ‘My Ugg boots have gone missing. You two are part of my search party. No one eats or sleeps until the boots are found.’ to the fabulously amusing illustrations, this is a story young children will enjoy. The humour is gentle and universal and the Australian element (comfortable rather than clichéd) is unmistakable. The dog who retrieves shoes, the old cubby house in the backyard which hasn’t been used for years (sitting like a mini haunted house), the Ugg boots themselves, even Dad chasing the garbage truck down the street, are all such a part of the Australian landscape. With six chapters, relatively simple words and colourful pages, it will extend beginner readers giving them a great chapter book they can easily engage with.